Sunshine and Tomatoes lives up to its title - it's bright, vibrant and full of life. Amy's posts are always full of tips, tidbits, humour and heart. From photos of stunning scenery to fashion, cultural faux pas to charming pick-me-up blurbs; this blog is always a pleasure to read! I love reading this blog. It's so wonderfully written, not stuffy or presumptuous in any way. The content is varied and interesting from lovely recipes which I've tried to a down to earth view of another country and its culture. I'd heartily recommend reading Amy's blog as often as you can. Her style makes the blog a pleasure to read, you always finish with a smile on your face and usually a massive plate full of Italian deliciousness to try! A perfect blog to read on a rainy day..now where to travel to next? Fantastic blog! Always interesting to read and great photos. Lovely interesting blog. Love Amy's humorous writing style. Always makes me chuckle! Amazing as usual! U cud try ur German abilities and post a blog in german -wud be fun! I love this blog! I feel like I live in Italy ;) Means I know exactly what to expect when I come and visit this part of the country. I love Amy's blog! It's very colourful and entertaining. I often Tweet it to my (mostly British) Followers, for whom it's created lots of interest, too. I'm also a British expat living and working in Italy (and married to one, "that's why I have an Italian surname"!! 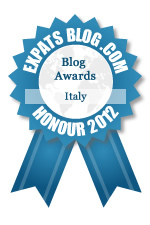 ), so it's wonderful to share common experiences of Italian joys and trials. I hope Amy makes her permanent home here on the Boot and that we get to see a lot more of her experiences!